Passion Facade of the Sagrada Família. Where the Nativity Facade's exuberance and profusion seeks to charm the viewer, the severe and barren Passion Facade offers misery. Six bone-like columns support a sharply angular pediment. Four stark bell towers rise toward the sky, marked with emaciated apostles. Recessed within the shadowy archivolts beneath the pediment are austere statues depicting the betrayal, torture, and crucifixion of Jesus. The facade is undergoing repairs. 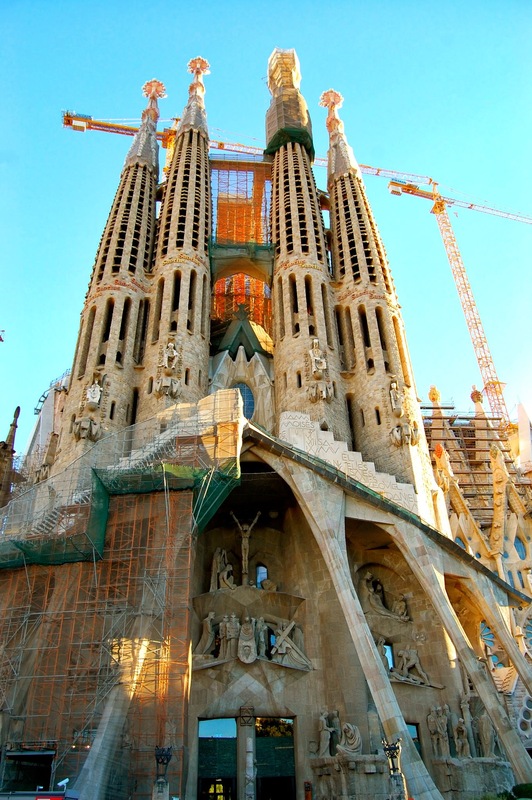 Architect Antoni Gaudí knew he wouldn't live to see the Passion Facade built, much less the cathedral as a whole. Though he provided detailed blueprints and sketches for the completion of the cathedral, some were lost in fires during the Spanish Civil War. 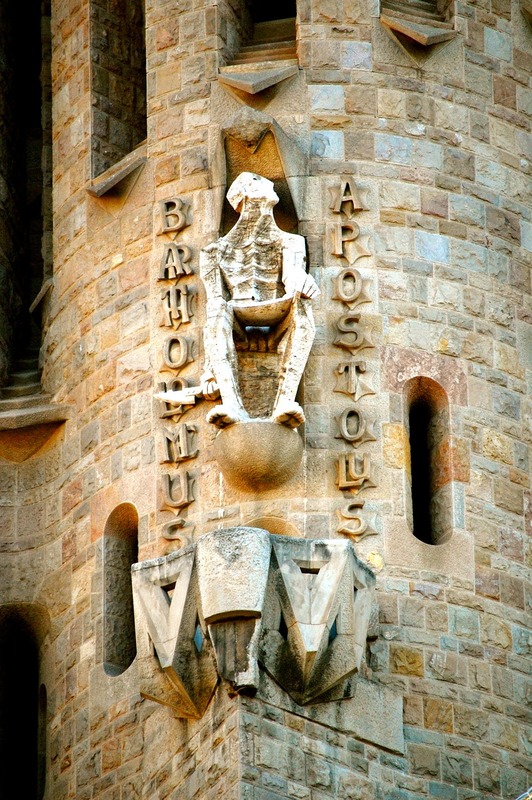 Today's architects, builders, and artists have proceeded since Gaudí's death by trying to honor his vision for the building, but controversy erupts periodically when elements of the cathedral are revealed. 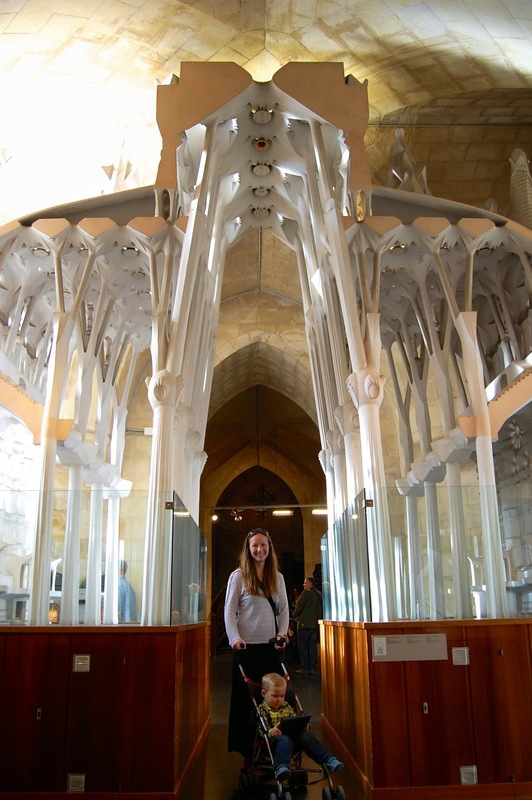 Of course, even Gaudí's vision for the building evolved over the decades he spent working on the building, so who can really know what Gaudí might envision with today's technological capability? Gaudí's sketch for the Passion Facade. 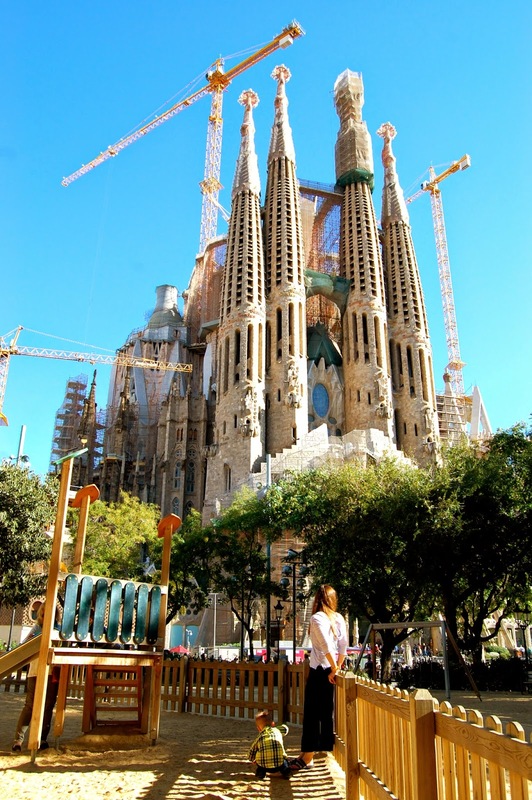 Part of the vibrancy of a visit to the Sagrada Família cathedral comes from the bustle of construction. Stones are carved, cranes are swinging, and workers are clambering. This is not an ancient project. It is a monument — one of the modern world's wonders — being built right now. You visit in the midst of an historic achievement, not decades or centuries later. Imagine Paris, in 1889, for the erection of the Eiffel Tower. Or Istanbul, from 532 to 537, as the Hagia Sophia went up. Or Athens, from 447 BC to 432 BC, as the Parthenon was completed. Stones now are precisely cut by machines, vastly speeding up the building process. I kinda wish they were still carved by hammer and chisel. Cranes rise above the apse of the cathedral. The crypt houses an extensive museum about the cathedral. A craftsman works on the painstaking details for a plaster model of the cathedral. 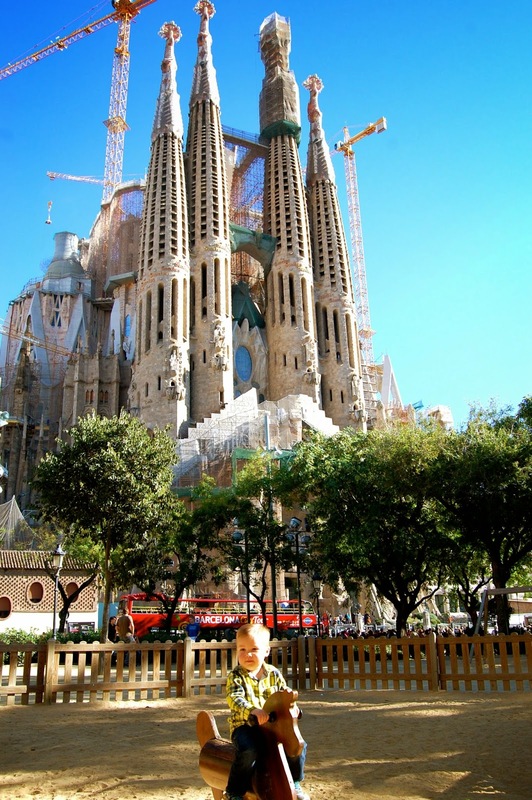 The Sagrada Família will become — has become — the building for which Barcelona is known. 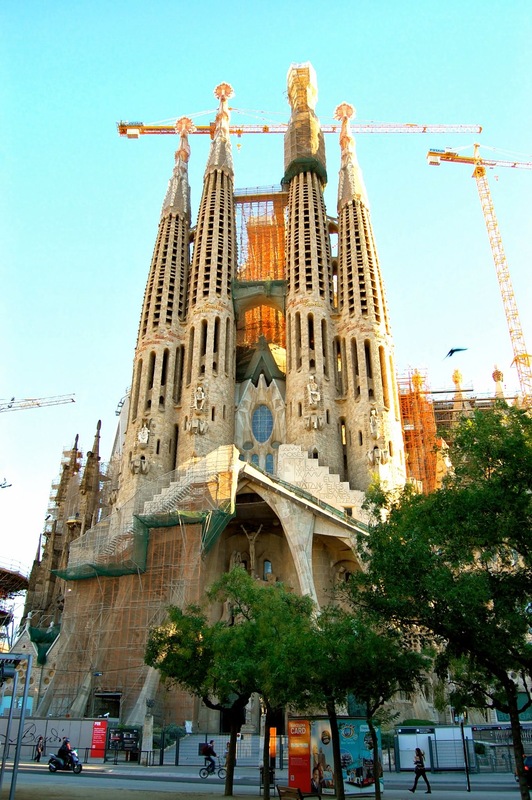 Just as the iconic Eiffel Tower and Parthenon represent France and Greece to the world, I think the Sagrada Família will represent all of Spain. Eventually, the cathedral's main entrance will be the Glory Facade on the south side of the building. A nine-story apartment building across the street will be torn down to allow a grander entrance and better view. The Glory Facade is still under construction. If all goes according to plan, the facade and the entire cathedral will be completed in 2026, the hundredth anniversary of Gaudí's death. For now, visitors to the cathedral enter through the Passion Facade. Construction began in 1954. The four bell towers were finished in 1976. 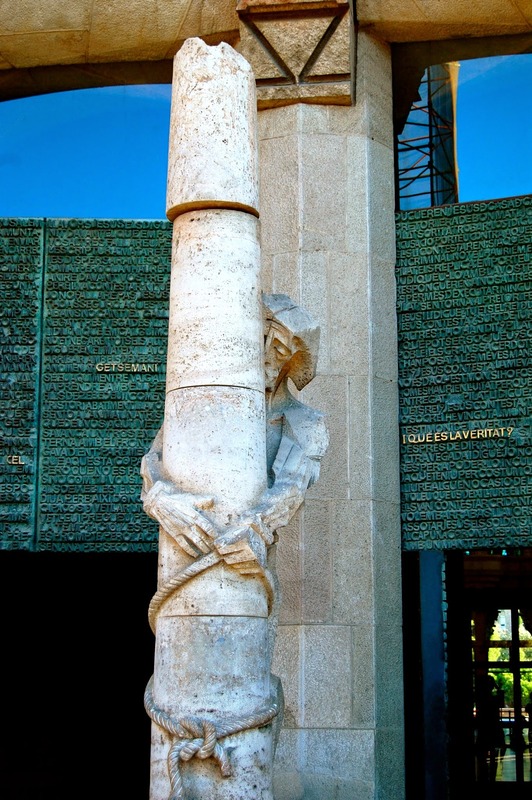 Catalan sculptor Josep Maria Subirachs started work on the facade's sculptures in 1986; he completed them in 2005. The apostle Bartholomew is often depicted with a knife because, according to one tradition, he was skinned alive and then beheaded. This Bartholomew appears to lack skin, as well. Doubting Thomas is depicted pointing to his palm. 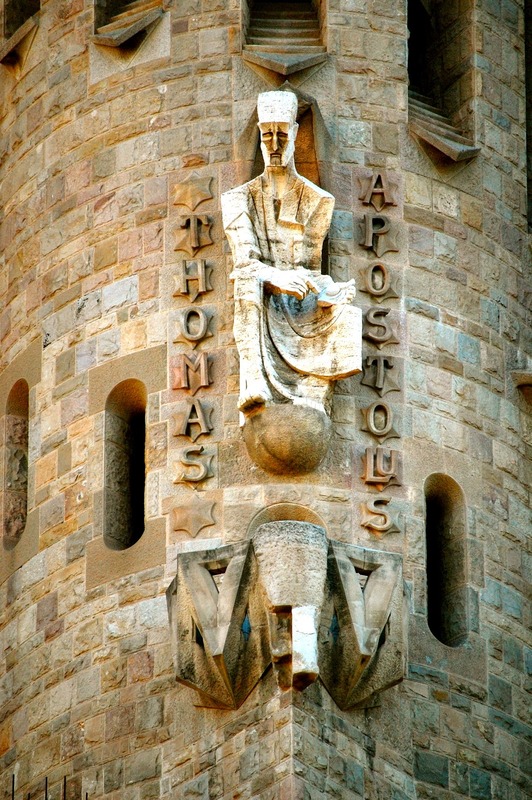 Thomas questioned Jesus's resurrection until he saw the crucifixion wounds. Echoing the figures on the bell towers, at the bottom center of the facade is a statue of Jesus tied to a pillar for whipping. The pain from flagellation. The bronze doors, with 8,000 letters, bear text from the New Testament about the Passion. 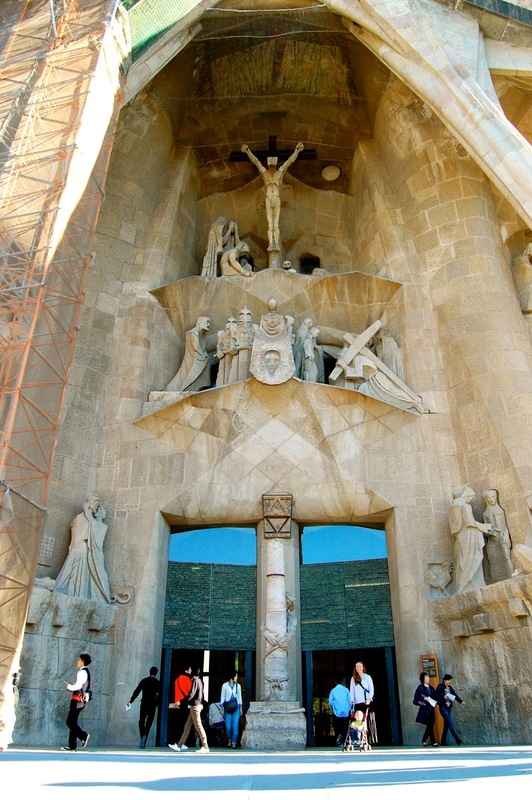 Unlike the Nativity Facade, where each of the three portals tells its own story, the portals of the Passion Facade are united by a version of the Via Crucis. Starting at the bottom left and proceeding upward in an S-shape, Subirach's sculptures tell the story of Jesus's path from the Last Supper through to being taken down from the cross and buried. 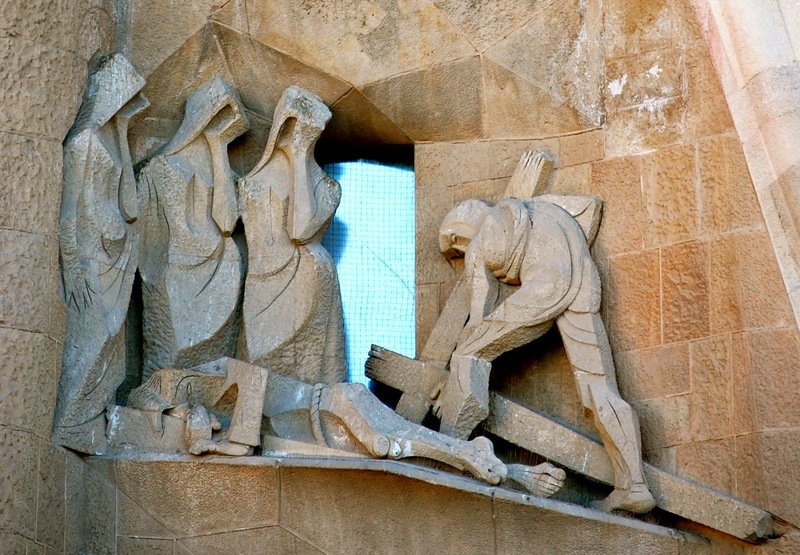 Subirach's version of these "Stations of the Cross" is his own and does not strictly follow either the medieval or modern versions of the Via Crucis. Judas's kiss; note the serpent behind Judas. The number grid always adds up to 33, the age of Jesus when he died — rows left to right; columns top to bottom; diagonals; four corners; four middle squares; four quadrants; middle squares on top row with middle squares on bottom row; middle squares on left column with middle squares on right column. Can you find any more permutations? Peter's denial. The women symbolize Peter's denials about knowing Jesus, made to a serving girl and others. Jesus wears a shroud, a metaphor for denial. Ecce homo ("Behold the man"). Jesus is presented to the crowd with a crown of thorns. Note the column in the background that says "Tiberius," the name of the Roman emperor when Jesus was crucified. Pontius Pilate washes his hands to signify to the crowd that he is innocent of spilling Jesus's blood and not responsible for his execution. The Three Marys and Simon. When Jesus collapses while carrying the cross, Simon of Cyrene is told to carry the cross for him. Helmeted sentinels stand guard on the rooftop of Casa Milà. Veronica wipes the brow of Jesus. Touched by pity, Veronica offers her veil to Jesus. When he wipes his face, an imprint of his face is left on the veil. (Sculpted here as a hollow-face image.) 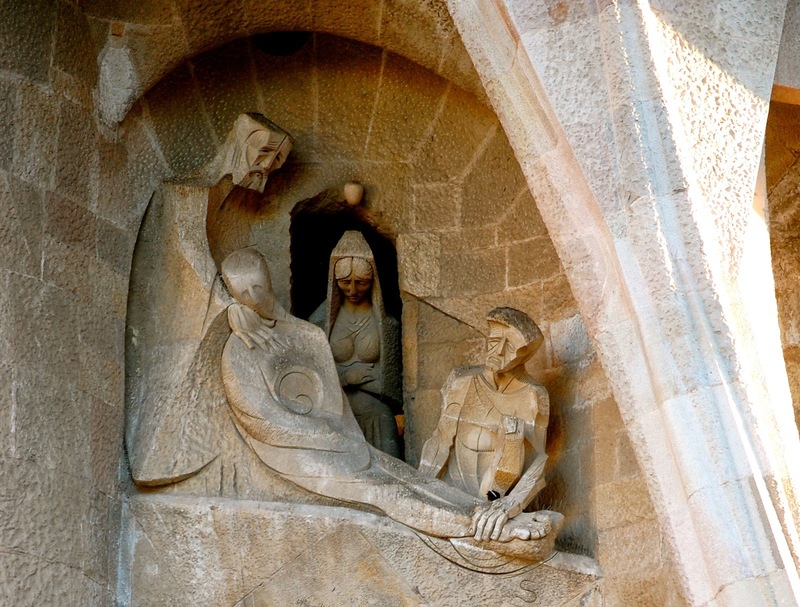 The figure on the far left is a/the Evangelist who will tell the story of Jesus, which Subirachs carved in the likeness of Antoni Gaudí in old age. Crucifixion and death. The iron cross protrudes parallel to the ground, to accentuate the hanging stature for the view from below. Jesus's head is presented as the pages of a book, representing the word of God. The painted red "I" symbolizes the Latin acronym INRI (Iēsus Nazarēnus, Rēx Iūdaeōrum, "Jesus the Nazarene, King of the Jews"). The orb in the top right is a moon, and the skull at bottom center represents Golgotha (Aramaic for "skull"), also known as Calvary (Latin calva means "bald head" or skull). Jesus is prepared for burial by Joseph of Arimathea and Nicodemus. The golden soul of Jesus ascends to heaven between the towers. Despite weighing several thousand pounds. The central portal. Between the doors (above the pillar with Jesus) is an alpha and omega. The facade's pediment and supporting arches are designed to cast afternoon shadows on the portals below it. My pictures were taken in the morning, with the sun on the opposite (i.e., eastern) side of the building, so they don't do justice to the light/dark dichotomy — some say chiaroscuro — of the facade. The Passion Facade is a grim aspect of the cathedral, a foil to the profusion and (mostly) happy scenes on the Nativity Facade. This facade reflects its subject matter and takes its job seriously. No gargoyles or fanciful beasts lighten the mood. The actions depicted are those of men. The pain is human. 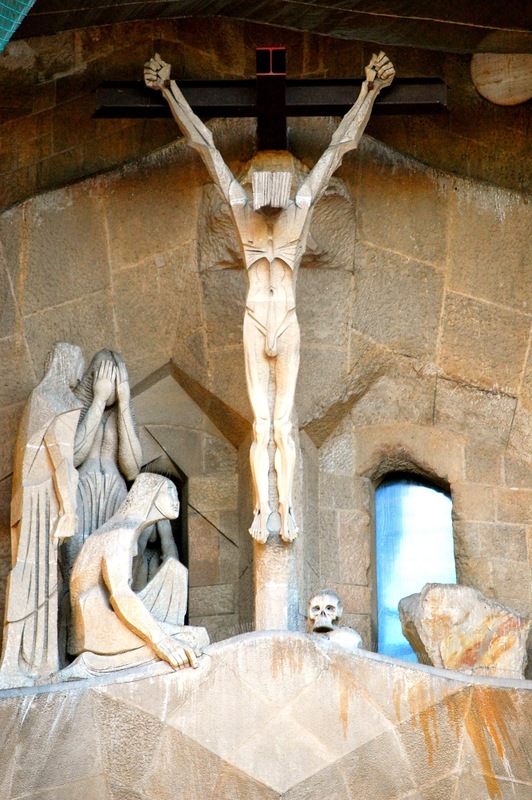 Gaudí was a devout Catholic who wanted to portray the angst and misery of the Passion without flinching. On a lighter note, across the street from the Passion Facade is a tree-filled square with benches and a playground. If you're stuck in a long line to get into the cathedral — even in November, the hour-long line stretched halfway around the building — you might be able to occupy wee ones in the playground while you wait. Or, like us, it's a great place to pause and unwind after serious touristing within the cathedral. A playground with a view. A climbing set for the older kids. Kid, go play. We'll sit here and marvel at the cathedral. In an upcoming post, I'll finally show you the inside of this amazing cathedral.